In December 2018 an object hit the Earth’s atmosphere at over 100,000 kph over the Arctic Ocean, entirely unnoticed, until the orange streak was spotted in satellite imagery. Meanwhile, two missions are currently exploring much larger asteroids – Japan’s Hyabusa-2 mission to Ryugu and NASA’s Osiris-REX mission to Bennu. Chris North and Edward Gomez discuss the unexpected impact and the latest results from Hayabusa-2, showing that Ryugu is a “rubble pile” rather than a solid object. Meanwhile, out on the edge of the observable Universe astronomers have been studying a galaxy, seen as it was just a few hundred million years after the Big Bang. The composition of the galaxy implies that its stars are not the first – and at least one generation has come before. We are used to discussing distant galaxies in astronomy these days, but in fact it was less than 100 years ago that we had proof of galaxies beyond our own. 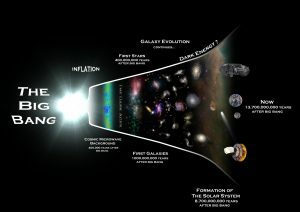 That discovery in the 1920s led to astronomers discovering that the Universe is, in fact, expanding. Cardiff University’s Dr Ermenia Calabrese explains what we know about the expanding Universe, and begins by describing what astronomers like Hubble and Lemaitre were trying to do in the 1920s. The story of our understanding has evolved over the decades, and seemed to be coming together until a few years ago. As measurements increased in precision, it became obvious that different methods of measuring the Universe’s expansion are giving slightly different results. Erminia explores why this might be, and what we might learn over coming years. An extended edition of an original broadcast on 28th March 2019 as part of Pythagoras’ Trousers on Radio Cardiff.